Affordable Accoutrements: BEIGE! The New Black? 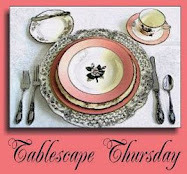 It’s time for another Tablescape Thursday with Susan from Between Naps on the Porch! You know what to do … dash on over and see what our gracious hostess has prepared for us today. Be sure to visit all the other participants. The tables are set, and they’re waiting to entertain us! I’ve wanted to set an all-white table for you for a while now. It’s difficult to go wrong with white; it’s clean, classic, and can be very elegant. But … what’s the old joke? Something about the blank canvas being a polar bear in a snowstorm? I decided to fudge a little and incorporate off-whites, creams, and beiges. Even at that, it was … interesting … photographing a table with a limited, pale, neutral palette. Naturally, I also used crystal and silver on the table, but they too can be difficult subjects to photograph. Everything on the table is vintage except: the tablecloth, the sugar bowl, and the pearl ornaments. You’ve seen the ironstone dishes before in my first (and thus far, only) Pink Saturday Post. You can see it HERE. The dinner and bread plates were Goodwill finds. The pattern is "Snow White Regency" by Johnson Brothers. The backstamp indicates that they’re from the 1960’s. I purchased at least a dozen of each size for a total of just under $10 (they were on sale for half price). They were in very good vintage condition (slight crazing on a few pieces … which doesn’t bother me at all). Looking across the dining room, into the sitting room. It seems to me that the white and ivory items on the table harmonize nicely with the pale yellow walls and off-white woodwork. Looking down at the center of the table. The round serving bowl and the white pitcher on opposite ends of the table were both GW finds. The swan and the shell-shaped container are flower pots … the swan from GW, and the other, part of a set of three graduated sizes from a thrift store. They’d been used, so I gave them a bath before I served you “pearls” for dinner! The inexpensive pearlescent ornaments were on clearance after Christmas at Hobby Lobby. The little ceramic cherubs scattered about came from my favorite junk store … and cost almost nothing. The silverplated napkin rings are monogrammed with an “S.” That’s a nice, curvy letter to have … even if it’s not my initial, right? The crystal stemware is by Heisey, stem number 6003. They were made from around 1953-1957. I found the set on sale at an antique mall in Benton, Illinois. They were dusty, but in quite good condition. The mall owner said the dealer who had brought them in is an elderly man who enjoys buying from estates and selling the items (and not too concerned about making money, which is why they were priced very reasonably). A closer view of the stem on the sherbet glass. The silverplated chargers were on sale at an antique mall. They can double as small serving trays. These paper doilies came with the glass plates ... probably had been sandwiched between them for decades ... the edges are turning brown and curling, but they were doing their job ... protecting the plates from scratches while in storage. The flatware is “King Cedric” by Oneida, introduced in 1933. This set was an eBay purchase … well under $50. "King Cedric" was one of the few silverplated patterns duplicated in sterling. The plated version was so popular that Oneida began selling "Cedric" in sterling beginning in 1949. I noticed that one of the teaspoons on the table is marked “sterling” on the back … otherwise, it looks identical to the others. 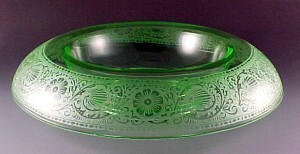 Oneida also produced china and crystal in the “King Cedric” pattern. The designs featured urns, fruits and flowers. At one point, that was a popular trend for silver companies to coordinate everything for the bridal registries. It simplified making selections and boosted sales … not a bad idea, was it? I like the way the underside of the plates is reflected by the chargers. The sugar bowl in the upper right is by Wedgwood. I bought it for 75% off at a local gift shop. I’ve used it as a container for small flower arrangements. Those faceted stems really sparkle, don’t they? I hand washed all the crystal just for you before setting the table. Thirsty? A close-up view of the pattern. I think the cutting is called Southwind. If not, it’s a very similar pattern. You’ve seen the flowers before. These Oak Leaf Hydrangeas were used in my first “Christmas in July” post. It’s HERE. They’ve dried nicely now. I plopped them down in a crystal candle holder (reg. $5.99, half price at Goodwill). It’s two pieces and wouldn’t hold water but, fortunately, no water’s required for this centerpiece! The candleholders are by Lenox (older ones, made in USA) from an estate sale … half price on the second day (of course!). The large white cream pitcher, bottom of photo, left of center was on sale for 49 cents at GW. The silverplated “silent butler” for brushing away crumbs between courses is by Godinger. It cost just a few dollars at an estate sale. Godinger manufactures plated items that look old and expensive, for a fraction of the cost of genuine antiques. It appears tarnished in the photo, but it must be reflecting the colors of the hydrangeas and of the chandelier. I DID polish the silver for you! How many swans do you see? I was glad the skies brightened for a few minutes to provide some natural light to illuminate this un-colorful setting! This shows the detailing of the vintage linen napkins. The table runner and placemats match the napkins. I purchased the set at a recent estate sale. They were in perfect condition (possibly never used). I think I paid under $5. You can see the details of the flatware pattern here. Art Nouveau design is characterized by organic, especially floral and other plant-inspired motifs, as well as highly-stylized, flowing curvilinear forms. “King Cedric” strikes me as an art nouveau design, with a deco twist. What do you think? The sterling salt and pepper shaker set also came from an estate sale …. another Day 2 bargain! The charger looks gold here, but it’s a trick played by the incandescent lights of the chandelier. I liked this photo because it shows the pattern of the Heisey salad plates. I ended up using this setting for a small impromptu dinner party. I’d been in the mood for chicken and dressing (stuffing for you non-Southerners! ), so that was what I served. I realize it’s not typical summertime fare but, if it sounds good, why wait ‘til the Holidays? Such an elegant table, Bill. I adore the little cupids and swans! Love the chargers with the beaded edge. If you find you don't have any room to store yours, I'll be happy to store them for you ha! The monogrammed napkin rings have "S" for swans..yes? Your flatware is lovely, I'm stlll wating to see the whole collection...not just the "ahem" tease you showed us of storage chests heehee. Love the touch of the pearlized ornaments. So many fabulous finds (good thing we don't go Goodwill Hunting in the same territory!) Great tablescape post. Very beautiful! What time is dinner? I didn't scape this week. Too busy with other priorities (dang!). Love playing with dishes! If this is impromptu, please invite me when you really plan a dinner party :) Gorgeous down to the last detail. Did I miss where the chargers came from? Hi Dear Bill! Oh, here you go again, wowing all of us ladies! Your table is truly beautiful! I have dishes that look just like yours but they are J & G Meakin and are very olden with glazing! Now the silver napkins rings with the "S" ~ you must send those to me! :) Love all of your uncolorful table. The swans and little cupids are so sweet! Now turkey and dressing sounds devine! I love it any time! This is such a pretty table, and I love that you used your 'fine dining' to serve chicken and stuffing (Northerner here)! I think I would feel very comfortable dining at your table then! This was a great post with great finds! I loved every detail from the beautiful linens to the elegant crystal (such a pretty pattern, and the work on the stem was just as pretty). My most favorite was the 'silent butler', I love the detail work on that piece and I think I would have it on display all the time. And I'm a very shabby chic kind of gal so I would probably love it even more if it were tarnished, but that was nice of you to go to the trouble of polishing it for your other guests! Bill, your table screams "WOW"!!! I love all of your white on white and beige with a touch of cream.. The glassware and silver lends another touch of elegance. I've yet to this day to own a a swan... I think I might have to be on the look out for a crystal one. If this was for an impromtu dinner party.. I'm wondering how you're going to w-o-w us with one you've planned, and when you do--- don't forget to include my name on the guest list... Once again... Outstanding..
Oh I so hold that philosophy in life...why wait for a holiday??? Beautiful setting Bill. I like your layering. That stemware is fabulous! The Oneida pattern is very nice. The overall effect of your table is so elegant. Happy TT to you! You must have a fabulous Good Will, we're lucky to find used plastic dishes. Gorgeous table, as always! I have yet to master the photographing of white dishes. The down shot of the the table is fabulous. It really shows the setting of the table. Any time is roast chicken time. I stuff mine with lemons. Bill this is so beautiful. I love the simplicity of the white....and I so love that salt and pepper shaker set. Gorgeous! Bill, I love everything about this! Your brilliant combinations make such appealing eye candy ~ I'd love to be sitting at that table right now. :) Bravo!! Thank you for providing lots of details, too. very nice, a classic beauty table! Bill...your table is gorgeous! So many beautiful details! I love the swans, the cherubs...and the wonderful way you layered the linens. Your crystal is stunning. Chicken and dressing is one of my favorite dinners...your right...why wait for the holidays! I'm so glad you have these beautiful pics with which to remember this tablescape...it is truly a work of art! Your friend must have felt so special dining at this amazing table! Bill... a grand table scape for sure! Just beautiful... I love the Heisey stemware.. it's one of my favorites! I'm so impressed that you were able to stick with the white theme... I know I'd have allowed the temptation in to do a little touch of pink here and there! Bill, another gorgeous notch on the tablescaping belt! That is so sophisticated, amazing! Glad to be able to stop by today, computer's still on the fritz! I love your table and the way you take us on a tour of each beautiful item. All of your things are so interesting. You have a special way of blending everything you find! I especially love your stemware! It's gorgeous!! It is a gorgeous setting, and I'll leave you with one question.....did you hang from the chandelier to take the pic of the table from above it????? Great job, Bill! How traditional, how beautiful and elegant. You did a great job, I love the cherubs too! You have a very special touch! Beautiful and classic. I think monotones are so calming and elegant. Oh, Bill, how exquisite! You are a party about to happen! I just love the way you use vintage things and make such elaborate creations! You're the best!! Beautiful table Bill! I love the tone on tone. I like dressing any time of year too, typically out of the box! Your tablescape is so elegant and beautiful. All the detailing you did makes it just stunning. So elegant and lovely, Bill. You surely have some wonderful pieces and the talent to pull every thing together so beautifully. I am in awe of everything you do...and especially love the whites and creams together. Love those sherbets! You always have something beautiful up your sleeve. Very Elegant Bill.. I love the white and silver and the lovely swans. I see you use the dollies to protect in between your china.. I did that for the longest time.. a friend told me she used coffee filters.. so now I do that.. they are way cheaper and protect great. Magnificent! What more should be said. Beautiful china, crystal, flowers, extras. Lots of work done on this table ... much appreciated! Superb Bill. Your tables are always beautiful. You must have a lot of full place settings!! The different hues of white are always a favorite. I love your silver chargers and the silent butler. This looks like a string of pearls for the table, and what's more southern than pearls! Fantastic job! Enjoyed viewing this and getting ideas. I love your table today and the photographs are great. It looks so elegant and they do say that beige and taupe are the new black. Looks like it would be a wonderful dinner with friends. Everything looks cool, classic, and elegant. Bill, this table is absolutely gorgeous - so elegant and just oozes class! The white with crystal is stunning! Your accessories, including the white doilies, add a sense of personality and charm to a beautiful formal setting. What time is dinner? Now this looks like a very special occasion table. Very pretty! I think you did a great job photographing it too. That dessert sounds yummy! Bill, what can I say? You provide us with so much eye candy each week. I always look forward to seeing what you've done. I love the whites and creams...and the swans...they're so elegant and beautiful. I want to come shopping with you sometime! VERY PRETTY! !You really got some great buys on what you used. I always do a "clean up" job on things I buy. Oh Bill, how pretty. I love how you used the swans and cherubs. You have such great taste! I call it dressing too! I really like the vintage look of this tablescape. Superb! An absolutely beautiful table -- love the tones. The dried hydrangeas make the perfect centerpiece yet keep the tone. You have so many lovely things and I like the peek of your living room as well. Bill, you find the best deals and set the most elegant of tablescapes! I've been searching eBay for tablescape items, but I don't know anything (think 0, actually) about what's good and all that jazz. I may need some knowledgeable advice in this endeavor. Also, you know so much about the history, etc., of these pieces. Maybe you should contemplate a post teaching some of the rest of us in this area? Not colorful? I beg to differ! It's very charming and colorful! This is so beautiful and elegant! As usual, your dishes, glassware and silver are beautiful. I love the swans with the ornaments and the hydrangeas. The silver chargers really make the table sparkle. What an elegant table!!! All of the details are marvelous!!! You have created a wonderful tablescape!!! Absolutely gorgeous!! Elegant, imaginative, delightful! I love it! What an elegant table setting but I am mostly coveting the glassware sitting on the plates! Beautiful table. 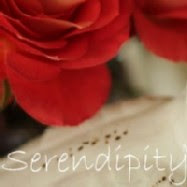 Come visit...I'm pleased to give you an award for your blog. Well I wasn't able to post a Tablescape this time around, but I still love to pop in and view everyone's tables!! I was oohhing and aahhing over your beautiful table. I loved the look you put together. I have never seen a silent butler. Very beautiful...you said something about using it to brush away crumbs? I would have loved to have seen the flip side of it. I am going to look one up on the internet. Your flatware is just lovely. Mmmmm..your dessert sounded yums!! What an elegant tablesetting... I still covet your silver salt and peppers and candlesticks... I have been watching on ebay... but people are kinda mean on there... just when you think you won... someone swoops in at the last second and take it for 25 cents more! Dang! Sometimes I sit there looking at the screen in disbelief. Anyway lovely table... did you photograph it at night be any chance? I hope you have a fabulous week end! What an alluring setting!I like your style Bill,very classy.I love the colours,swans....well everything. Naked babies on a Southerner's dining table!!! How scandalous! I love it. I love this setting, Bill. It is just positively beautiful. Another wonderful tablescape! Very beautiful! You have an amazing way of paying honor to a beautifully decorated table! !